Roger Federer is expected to play on the clay after a considerable – three-year – hiatus and not expecting much except to test how his creaky and old body survives the rigors of the clay and pick-up a few ranking points along the way. Novak Djokovic and Kei Nishikori, however, feel Roger Federer can still be a threat on the clay and cannot be written off. Novak Djokovic’s observation on Roger Federer’s prospects on his return to the clay this year. Novak Djokovic believes that, even after a three-year absence, Roger Federer can be a force on the clay. Federer’s fans are suspect of any praise, of Federer, by Novak. We feel it is big of Novak Djokovic to acknowledge Roger Federer. “He is who he is, so you always expect highest from him. I mean, I thought tennis was missing him definitely on clay last year,” Novak said. “Personally I think most of the people understood why he decided to skip the clay court season last year, and I also understand why he wants to play. Definitely, for our sport it’s better that he plays. We’re looking forward to see (Federer),” Djokovic added. “I mean, he’s been playing some great tennis lately. You know, Indian Wells, Miami, he’s won two out of three. Played finals, Indian Wells. It’s as good as it gets.“ Said the Serbian with a winning 25-22 head-to-head against Roger Federer. Needless to say that even Novak pegs Rafa as the favorite in any tournament, including the French, on the clay. Kei Nishikori’s assessment, of Roger Federer’s prospects on the clay, seems more fan-like. Roger Federer is scheduled to play Madrid and has not signed for the Monte Carlo event this year. Kei Nishikori, in an interview in Monte Carlo, was quite positive about Roger’s prospects on the clay this year. “Everything is possible – for Federer -” Kei speculated. “It (Roland Garros) might be tougher for him than winning the Australian Open or Wimbledon, but I’m sure he can do anything if he tries 100 percent,” added Nishikori. 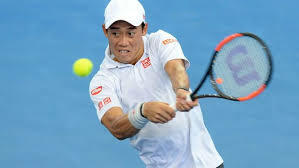 Kei continued with the unabashed praise of Federer and acknowledged that the Maestro’s, and his tennis, is unique. “He’s a lot different than anyone else on the Tour,” added the World Number 6 who didn’t stop at calling Federer different, but continued with his exaltation of Roger like a giddy teenage-fan. “I’m sure Roger can do very well on clay, he’s still my idol; he’s the best player in history. I’m happy to see him playing more tournaments, (and) I hope I can play him again,” said the Japanese player who has a 3-7 losing-record against Federer. We, however, feel that Roger Federer should have stayed away from the clay to improve his prospects at Wimbledon. ← What’s wrong with Alexander Zverev’s game?